The JFK Jazz Machine is a big band-style jazz ensemble that performs multiple times a year, both at school functions and in the community. In addition to performing jazz standards, the Jazz Machine also boasts funk, bossa nova and fusion in its repertoire. Over the past few years, the Jazz Machine has had the experience of working with professional jazz musicians, partnered with Jazz House Kids, over the course of a month, culminating in a community performance at Woodbridge Middle School. In 2016, the Jazz Machine received a Gold rating in the PAC for a Day Music Festival, with Nicholas Brennan receiving an outstanding soloist award. 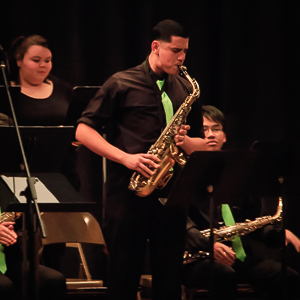 The JFK Jazz Machine is an auditioned group, with auditions taking place in October. Practices are held Mondays 6:00pm – 8:00pm and Wednesdays 7:00pm – 8:00pm.